Sailing - A lifetime of enjoyment, activity, competition and comraderie with some of the best people you could ever know - SAILORS ! When I was 14 my Dad bought a Penquin class sailboat. It was a result of his growing up in Chicago and watching the sailboats on Lake Michigan. 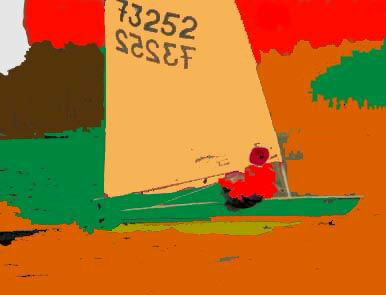 He never had sailed, but wanted to get involved with the sport. The Penguin is a cat rigged two person boat. Ours was very much overweight but built very well. It actually had an entire coat of fiberglass cloth over the outer hull in addition to lot of very heavy wood in the centerboard trunk, thwart, and transom. Racing weight was 130 lbs. Our Penguin tipped the scales at 210 ! Our basic strategy was to get the boat moving and then keep it moving (ghosting along) by being really still. Dad named the boat "NUFF" as when we were sheeting the main he would say- let it out, let it out, "NUFF!" My Dad was a great believer in not oversheeting the sail.